At Douglas Metal Finishing here in london, we are experts providing top quality gold plating services for luxury items, religious articles and domestic articles. Trusted for reliability and superior workmanship, our worldwide list of clients includes film, theatre, and manufacturing industries some of whom have a royal warrant. 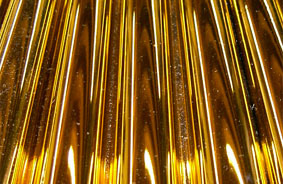 Our standard "Gold" finish is in fact the purest of all the gold finishes that we produce. It has a very rich colour because there are so little other metals added but of course this does make it the softest and therefore the most susceptible to abrasion. It is mainly used for its decorative appearance on articles which are not going to be handled so if it is liable take any wear and tear, the deposit required needs to be considerable thicker than the other gold finishes we offer. We do not deal in "gold substitutes", all our gold finishes contain the "real thing" and therefore always enhances the value of any products that pass through our processes. If you are looking for the quality of gold but with a practical durability try one of our other processes. Pure Gold is 24 carat and is extremely soft. This is why jewellery is usually constructed of 18 or 22 carat gold, not to save money, but so other harder metals can be mixed in which will strengthen the finished article and make it considerably more durable. We offer Incalux Gold, Incaloy Gold, Antique Gold and of course "Gold" pure and simple with it's rich 24 carat colour. Specialising in Gold Plating. We have an established factory and probably the largest gold vats in the UK. Our state of the art equipment for Gold Electroplating means we can accommodate large items like statues, heated towel rails or even car bumpers.